All my life I have been an active healthy individual. However that all changed in 2013 when I became pregnant with my third child. Five months into the pregnancy I started experiencing severe pain through my hips and lower back and the pain continued to spread throughout my body to every joint, each movement was agony. My mobility was reduced to shuffling my feet an inch or two at a time to get from my bed to the bathroom, and any greater distance I had to use crutches to literally drag my body along, or use a wheelchair or mobility scooter. The pain was not only physically draining but also emotionally devastating as I also had two young girls to care, and with my family on the other side of the world in Ireland, my support network was very limited, I had never felt so alone in my life. During the pregnancy my doctors diagnosed me with an unstable pelvis which was responsible for all this pain, and would resolve itself when the baby was delivered and I would get my life back. Mentally I clung on to this and told myself everything would be ok. In September 2013 I gave birth to a healthy baby boy and our little family was complete. I had hoped my pelvis would magically return to normal and my life could resume. I had brief respite from pain for a few weeks but unfortunately it then ramped up again and spread throughout my body to leave me yet again crippled in pain and struggling to move. The doctors were baffled by my symptoms and I started a battery of tests to try to find the root cause and hopefully a treatment pathway. I underwent numerous blood tests, MRI’s, x-rays, CT scans and bone density tests. I tried many different physiotherapists, chiropractors, wellness practitioners, treatments such as acupuncture, dry needling, and kinesiology. In September 2014, I was referred to a rheumatologist, at this point my range of movement was severely restricted, to the point I couldn’t walk any further than 100metres. In late 2014 I was diagnosed with an autoimmune disease called Ankylosing Spondylitis. The first thing I did was to google it.. bad idea as I read it is a type of inflammatory arthritis of the spine and large joints causing chronic pain and discomfort, which will result in what is known as bamboo spine, as the vertebrae in your spine eventually fuse. I was numb with shock that my life would never return to normal and I would never run, or play soccer again, I was devastated. I cried uncontrollably all the way home and thought about ending it all. I started on a course of treatment which involved weekly injections to alter my immune system and hopefully reduce the pain in my joints. Unfortunately the side effect of this was a lower immunity to all the germs the children carried home from school and every other week I was sick with something else and regularly got pneumonia. It was a never ending battle to get through the day and try to provide love and care for my 3 small children. The best way to describe how I felt then was like Alice in Wonderland caught in a dark rabbit hole and every time I tried to climb out I would be knocked back down again. The toll it took on me mentally was obliterating as I had suicidal thoughts and was treated for depression. I was a shadow of my former self, which was a person full of life and always laughing. However being a very stubborn Irish woman, I would not give up and accept that life. I persevered and started reformer pilates which eased my pain, and I was determined to return to work as a chemical engineer as my mind was craving stimulation. After 3 months of reformer pilates which mobilised my joints, I returned to work in August 2015. 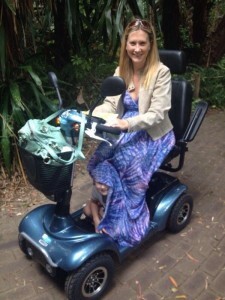 As I still could not walk for long distances I was told the only exercise suitable for my joints was cycling. This was the start of my cycling journey. At first I could only ride a stationary bike in the gym for 400 meters and every week I would increase this by 200m. I graduated to a mountain bike on the road, and cycled the 4km from the gym to work. Every week I would try to add further distance to my ride by driving to a point further away and increase my fitness. During this time I was still experiencing new pain in other areas of my body and I was further diagnosed with fibromyalgia and rheumatoid arthritis. The quantity of drugs I was now taking was ridiculous, with each drug there was a side effect so I would have to take something else. Upon questioning my rheumatologist as to the effectiveness of all these drugs, I was dismissed for questioning his judgement, so off I went to find a new doctor and further answers. The rheumatologist I visited also happened to be a cyclist so we hit it off straight away. I will never forget the day sitting in his office to discuss his review of my case, where he told me he believed I did not have ankylosing spondylitis or arthritis but a severe case of fibromyalgia. Again I started crying but this time it was tears of joy and once home to the family, hugs and kisses all round. It felt like my death sentence had been lifted. The new course of drugs was mostly pain relief and no more injections altering my immune system, and within 8 weeks I could feel my body coming alive again. My husband and I went on a well-deserved weekend away to Bali in February 2016 and he took me mountain biking. It was magic coming down through the jungle into the rice paddies, I was beaming with happiness. As soon as I got home I wanted to start mountain biking and looked at buying a bike. I was slightly worried about how my body would cope with the bumps and jolts, so the first bike I bought was like a big spongy couch, with longer travel and dual suspension, more of an enduro bike than XC. I was thrilled with myself and set my sights on racing the xc state series and the first ever race I entered in C grade I won ! Mountain biking not only changed my life but that of my whole family ! All three of our children threw themselves into the sport, following in the foot-steps of mum & dad. Every weekend we would load up the car and head off to another race. In my first ever season racing in 2016 I managed to come 3rd in the B Grade state series, won the veterans category for the Dwellingup 60km, the WA State championship, the Kalamunda Classic (duo). I also took part in my first ever Cape to Cape finishing in 14th open female and 24th overall female. I had to pinch myself by the end of the year considering where I had come from. 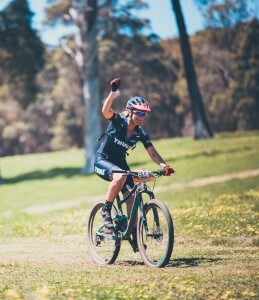 I went from strength to strength and in my second year of mountain biking and won the B grade state series. Unfortunately at the end of July 2017 I crashed off my road bike and broke my thumb on my right hand. I spent a week in hospital being wired back together, and was told I couldn’t ride a bike for 12 weeks. My first thought was Cape to Cape & can I still do it, which was exactly 12 weeks away, so whilst in my hospital bed I went online and bought an indoor smart trainer to enable me to keep my fitness up. The operation on my thumb caused all sorts of complications with my medication for fibromyalgia, and the month of August was a complete write off due to a huge flare-up of my fibromyalgia with all the trauma from my thumb. When the fibro fog as they call it lifted at the start of September, I started training for Cape to Cape, the countdown was well and truly on 8 weeks to go, can I do it? The smart trainer became my best friend along with Zwift and my new digital cycling world. The wires in my thumb finally came out at the start of October and I began intensive hand therapy to get some movement in my thumb. Unfortunately 2 weeks out form the race X-rays showed my thumb had not healed as hoped and the bones were not fused together. Luckily my hand specialist was also a keen cyclist and understood my determination (Stubbornness) to race after training all year for this event, so he made a custom rigid splint to protect my thumb. The positive of my splint was being able to get back on my bike, however the negative was the inability to grip the bar fully with my right hand, plus of course I couldn’t shift gear with this hand either, the solution was to put a grip shift on my left hand to change gears on my rear derailleur. This certainly made for interesting riding as I had to deal without full grip in my dominant right hand, whilst shifting with my left meant that didn’t have full grip either, fun times! The end of October arrived and as I lined up for the start of only my 2nd Cape to Cape, I had zero expectations, my best outcome was to simply give it everything without injuring myself. To my utter amazement I finished 8th in open women and 9th overall, words aren’t enough for how I felt, the sense of accomplishment and the pride in knowing no matter what life throws at you, never give up on your dreams, as sometimes they do come true. Many women out there lead very busy lives, as mothers, wives, professionals and many more suffer with chronic physical and mental illnesses. I am one of those women and I would like to encourage all women like me, to not lose hope when times are hard, my outlook on life is ‘life is not about waiting for the storm to pass, it’s about learning how to dance in the rain’. Thinking about getting into mountain biking? Stop thinking about it, just do it and you will never look back. I would like to thank all my friends and family for their on going support that has been helping me achieve successes both on and off the bike. Special thanks to the team at Midland Cycles in Perth. In appreciation for their support I am very proud to be part of the team running MTB fun rides in 2018.